William (Chub) Coyer has been active in athletics throughout his life. In 1932 he earned his first baseball letter at Orrville High School. By 1936 he had earned four letters in baseball, three in football, and two in basketball. He was chosen all-league halfback in the Western Reserve league for two years and led in scoring in the 1935 season. In one game (against Kent Roosevelt) Bill ran for four touchdowns, including an 80 yard jaunt to the goal-line. At Ohio State, Coyer earned a pair of letters in baseball and another in football while receiving a degree in Physical Education. During high school and college he played on various baseball and softball teams throughout this area. 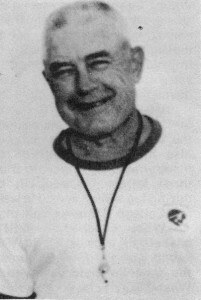 Coyer’s coaching career began in 1940, as an assistant football coach at Mount Union College in Alliance. His next position was at Clinton High School in Clinton, Ind., where he was head football coach. His 1942 team won the Wabash Valley League championship. After service in the Navy in World War II, Coyer returned to his home town of Orrville to take over the duties of head coach in baseball, basketball, and football, as well as physical education instructor. In football, his teams won Northeastern Buckeye League titles in 1946, 1947, and 1948. They won the League basketball championship in 1949. The 1949 baseball team won the District crown. He also coached the American Legion Wayne County Champion that same year. In 1950 Chub moved on to Elyria High School. He stayed there until 1955. The following year he became head football coach at Morton high School at Cicero, Ill.
From 1956 until the present, Coyer has been at Niles Township High School in Skokie, Ill. He is head baseball coach and assistant football coach. His baseball teams have won three state championships. In one title game, his team stole twelve bases to set a state record. This June, Coyer intends to retire after 35 years of teaching and coaching.